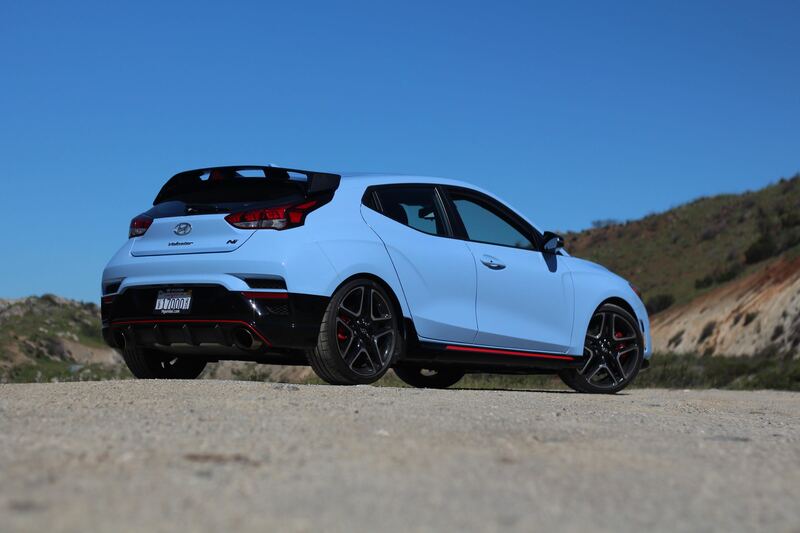 What’s Good: It’s a complete hot hatch package. 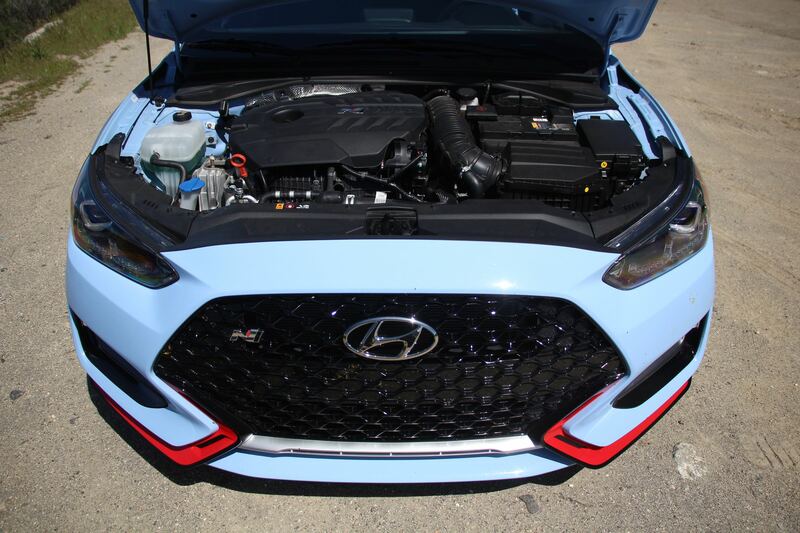 This Veloster N is an entirely new and exciting endeavour for Hyundai. 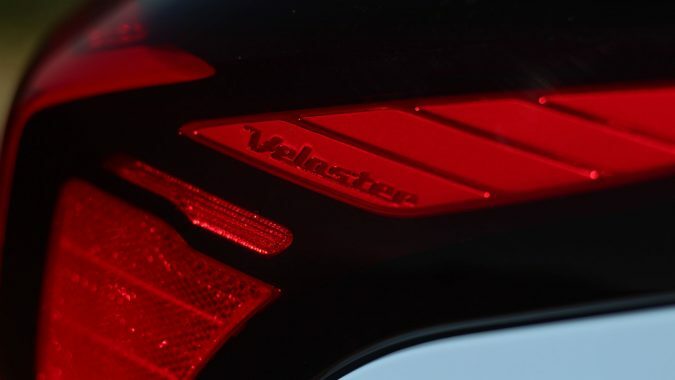 It marks the first time the company has taken a swing at a legitimate performance car. 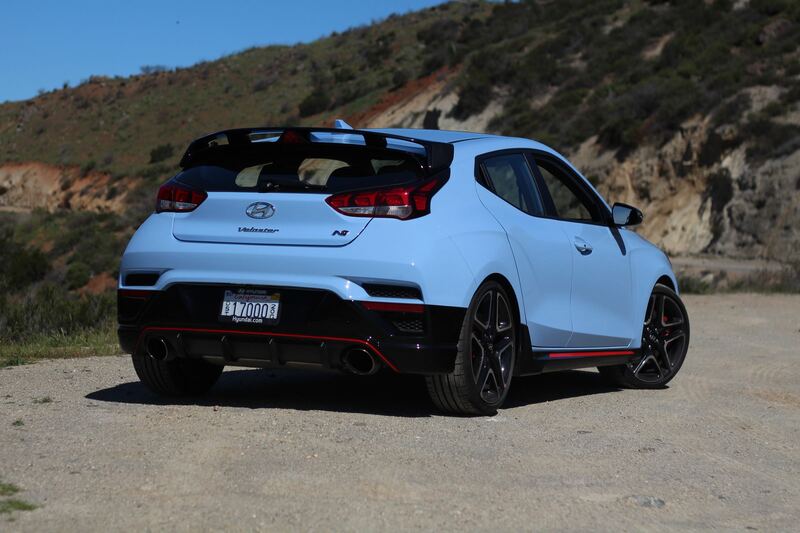 And they’ve done all the right things to make this unusual compact car achieve rightful status among today’s hot hatches. 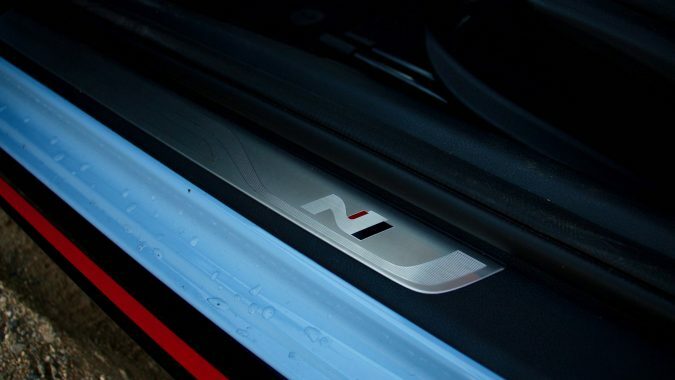 What’s indisputable is that the N is indeed a factory special and its treatment can’t be duplicated thought aftermarket parts or tuning. 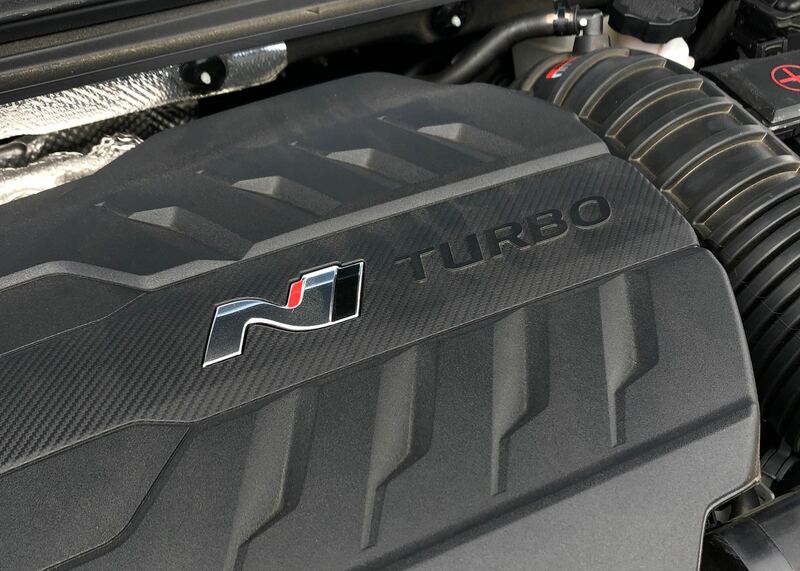 It starts with the age-old recipe of stuffing a big engine into a little car. 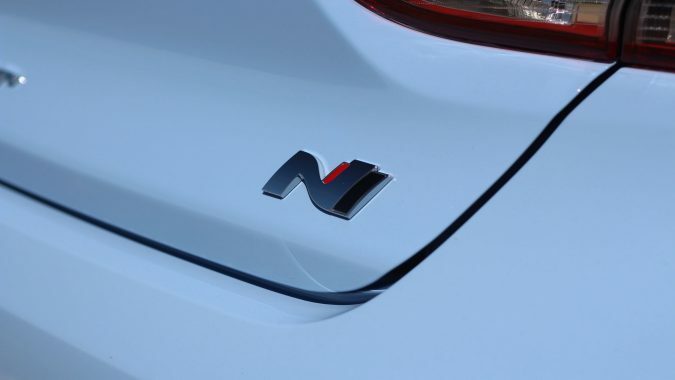 The N uses the company’s familiar all aluminum Theta two-liter turbo four-cylinder engine and here – with the performance package – produces 275 horsepower at 6,000 RPM and 260 pounds feet of torque. 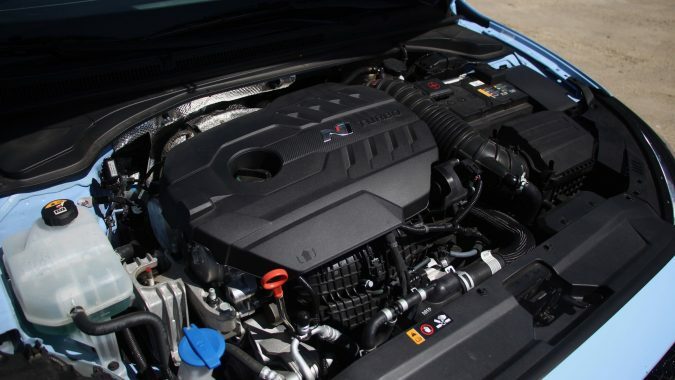 The torque curve is brilliant — peak torque runs from 1,400 to 4,700 RPM – which is exactly where you need it. 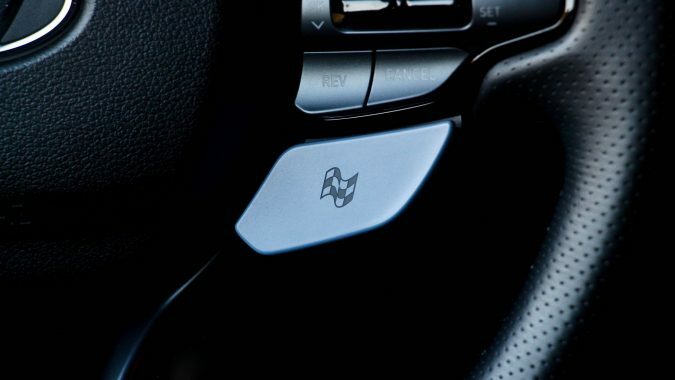 Throttle response is crisp and even when heel and toeing, it gives you the bump you need. 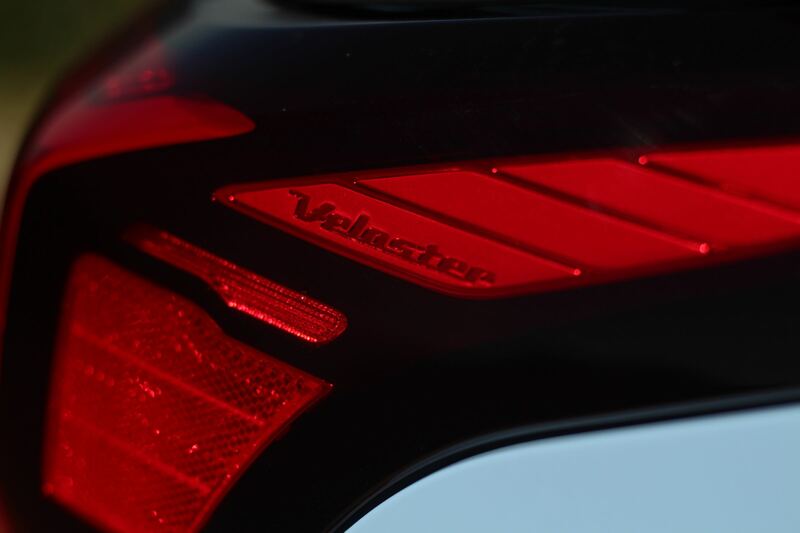 Cheaters can use the built-in rev-matching function and thankfully it’s easily switchable to off. 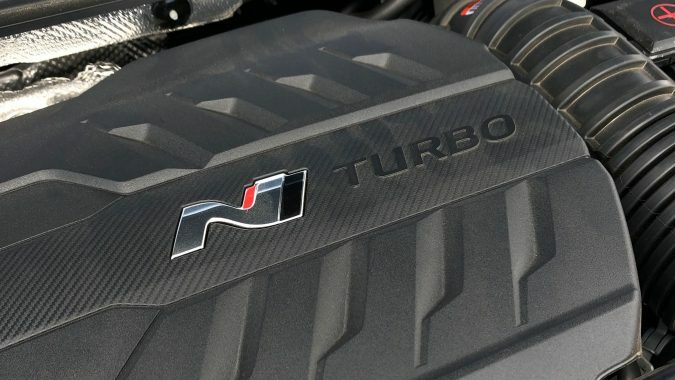 The exhaust note? 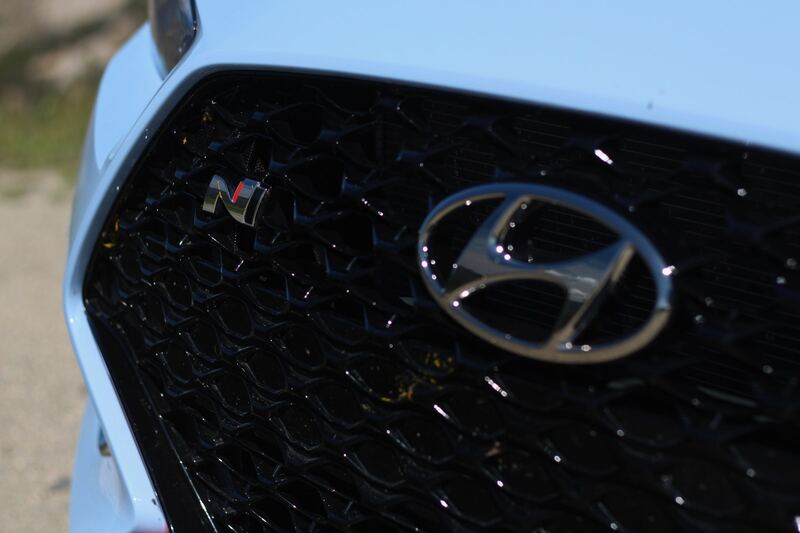 Well, in maximum attack mode, it’s got real attitude. 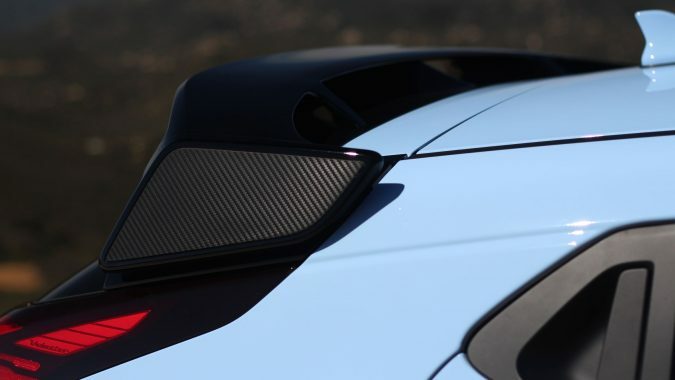 An exhaust baffle opens, giving it a throatier idle, and then on deceleration, it pops and cracks with the best of them. 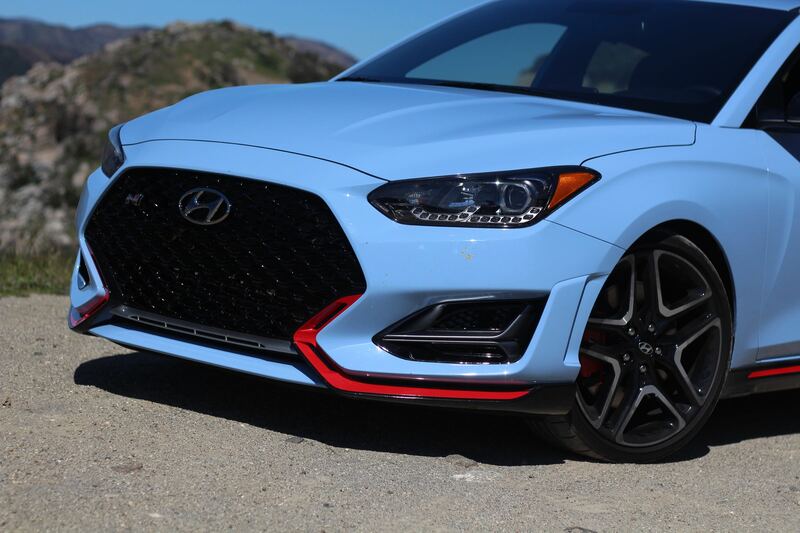 In the real world, the eager four-cylinder turbo gives the little Veloster a whole lot of punch. 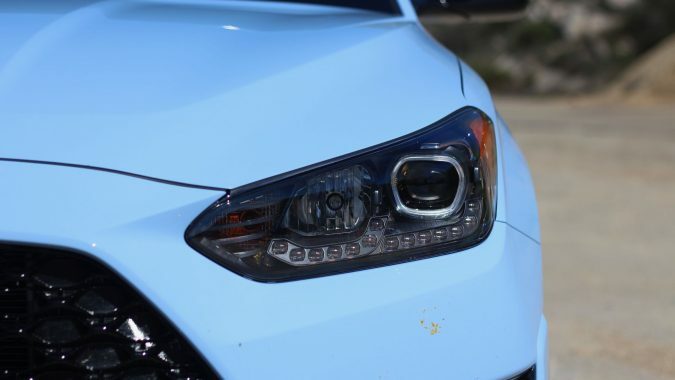 Much more than you’d think the Performance Blue would allow. Yes, that’s the actual name of this colour. 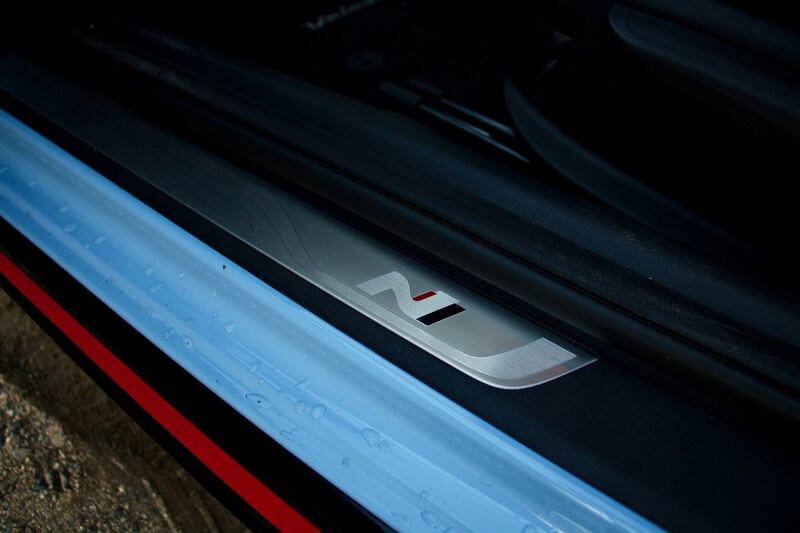 Sure, it’s a distinctive shade of blue, but not a colour that you’d associate with power and, well, performance. 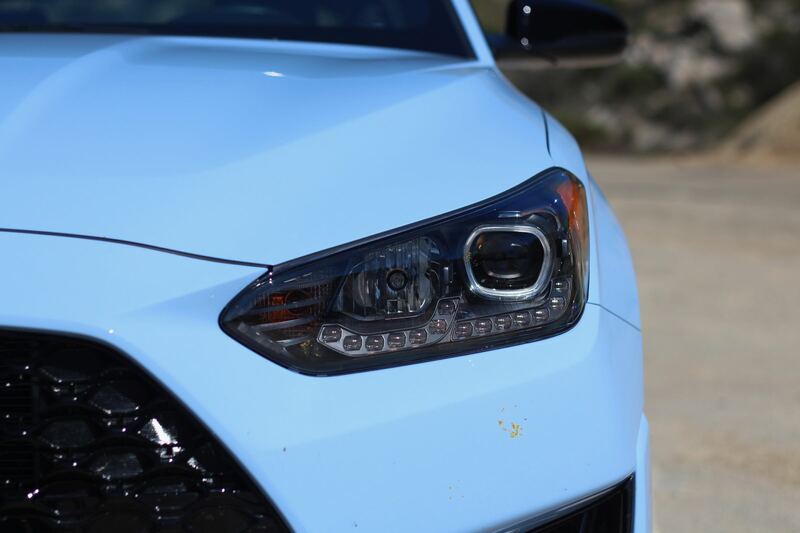 As much as this blue is the signature of the N brand, given the sporting nature of this Veloster, a stronger colour might suit it better. 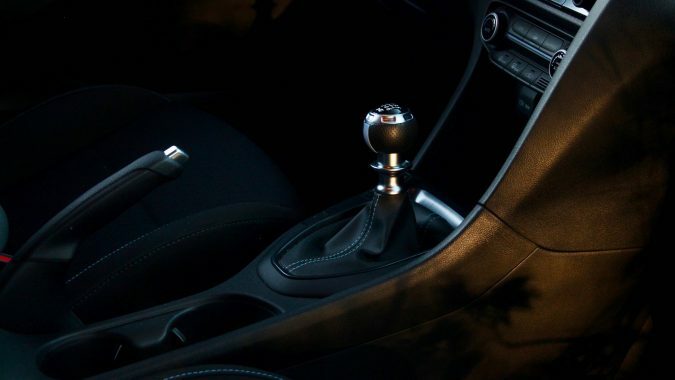 There is only one gearbox and thankfully it’s a fantastic six-speed manual with short throws, perfect ratios, and gates that are clearly defined. 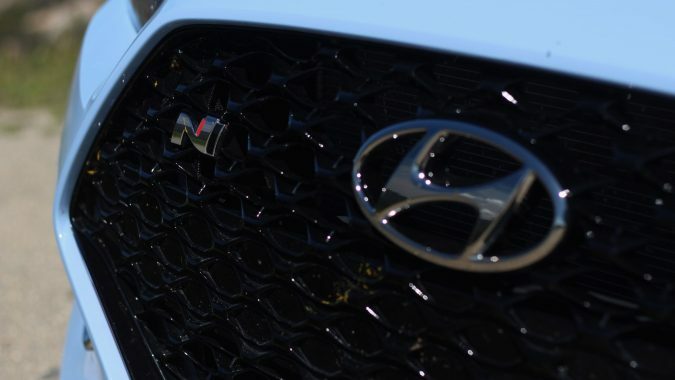 The gearbox is a joy to row and it’s clear Hyundai’s done their homework here. 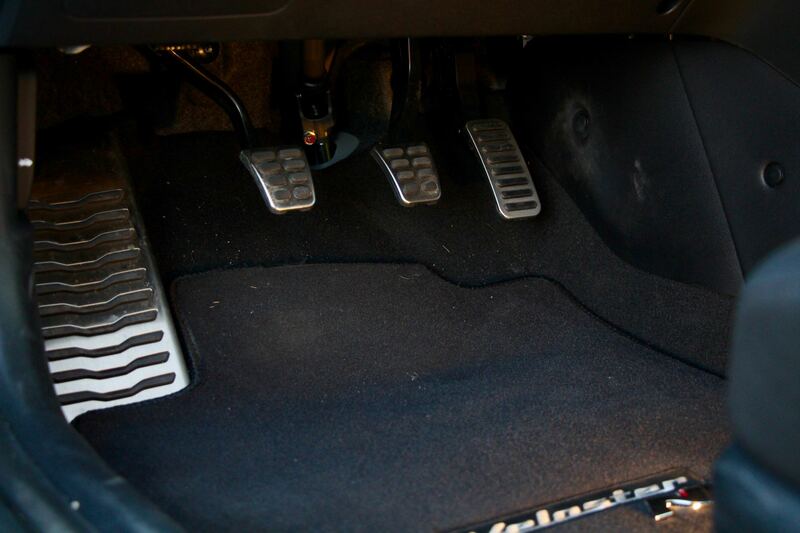 At the end of the gearbox, there is this car’s pièce de résistance, which is its electronically controlled, limited-slip differential and it works exactly as prescribed. 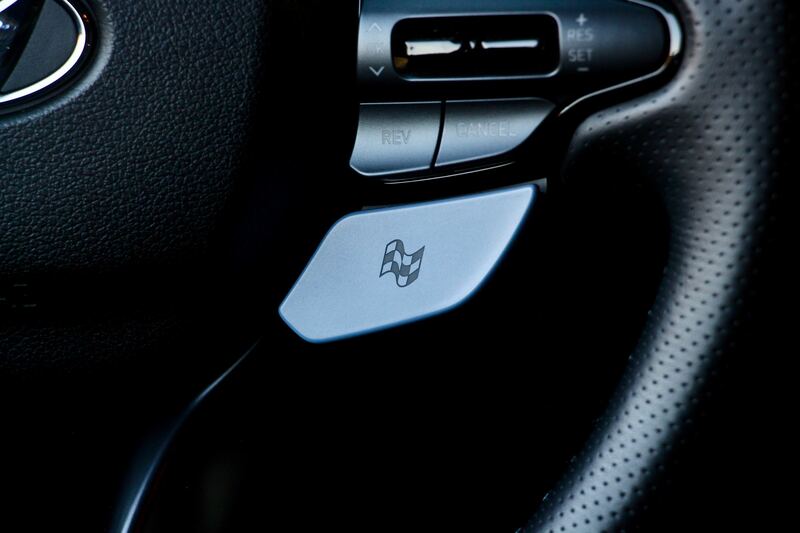 It distributes power to the wheel that needs it, based on the demands of the driver in combination with the car’s real-time dynamics. 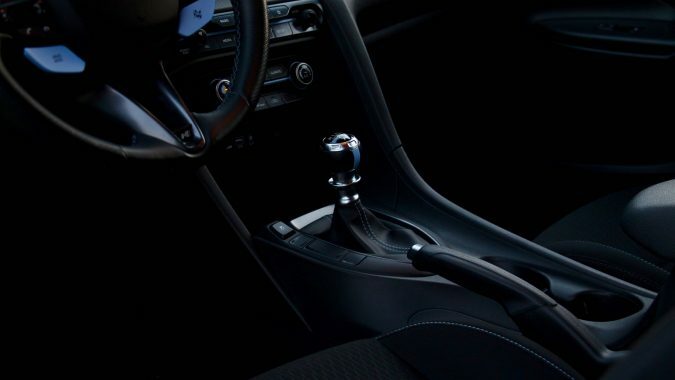 Unlike a mechanical differential with a fixed lockup, the e-diff is entirely variable and in the real world that means this N feels sure footed, giving the driver sublime confidence behind the wheel. 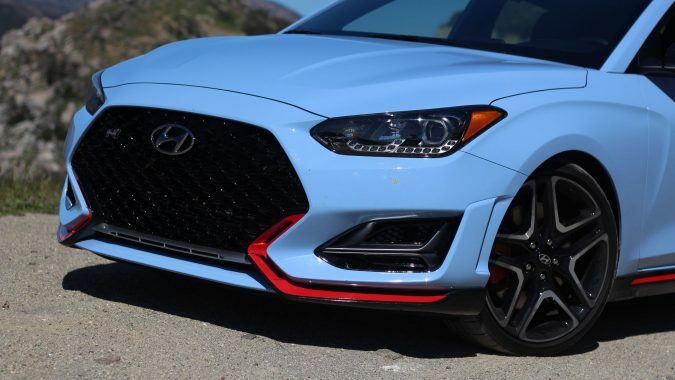 Hyundai does something that no tuner could ever do, which is reinforcing the body-in-white with more welds throughout the structure, truly making this a proper factory special. They also reinforce the upper strut mounts and add some chassis bracing. 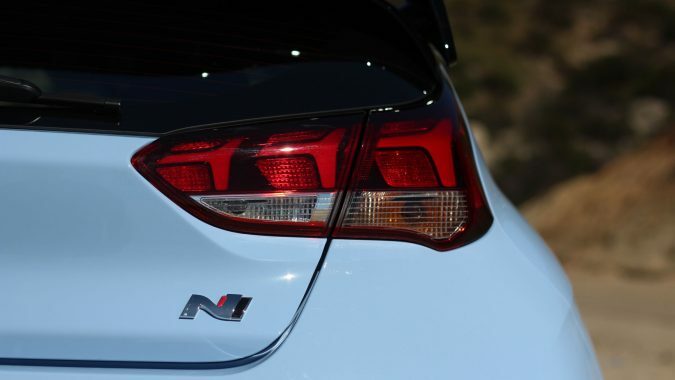 Yes, the N’s handling was developed on the infamous Nürburgring Nordschleife, but unlike some automakers who seem to send their cars out into the world with overly stiff suspensions, the ride in comfort mode is acceptably compliant and the spring and damper rates allow the suspension to work, keeping the tire in contact with the road. 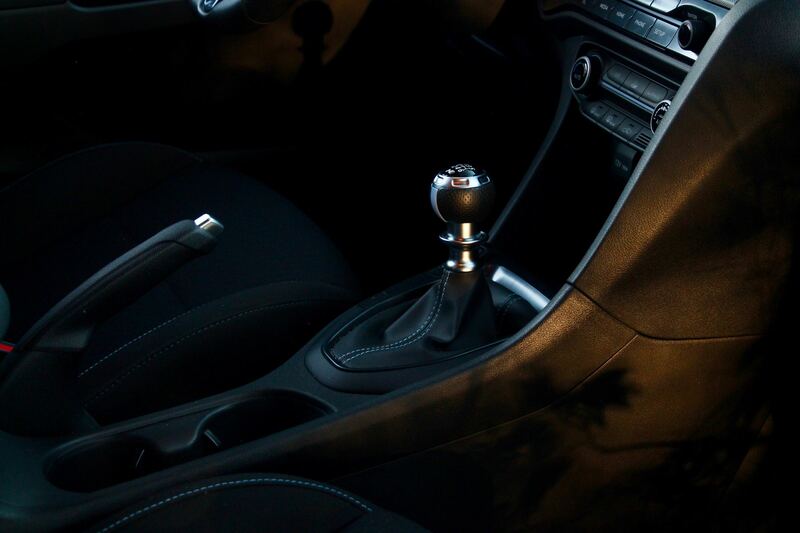 In comfort mode, it is indeed comfortable and it’s only when the dampers are set to more sporting settings that the ride becomes overly firm, which is best left to the race track. 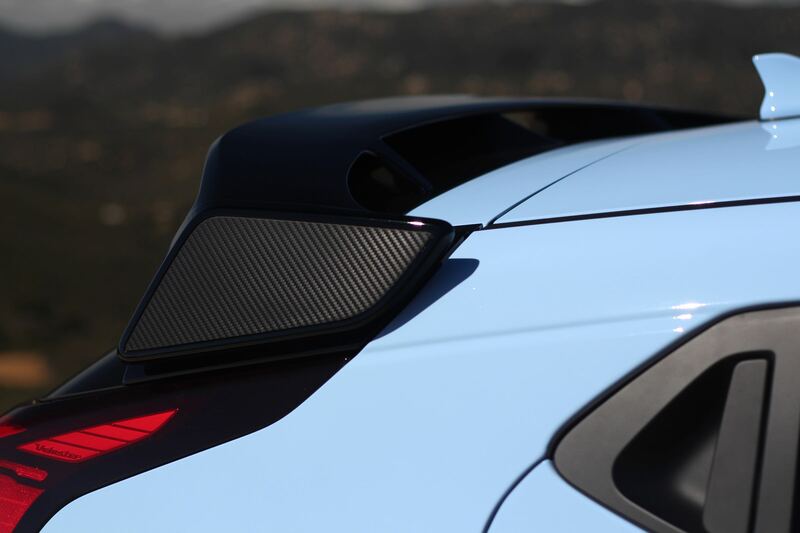 Turn in response is as crisp as a February morning and chassis feel is superb. 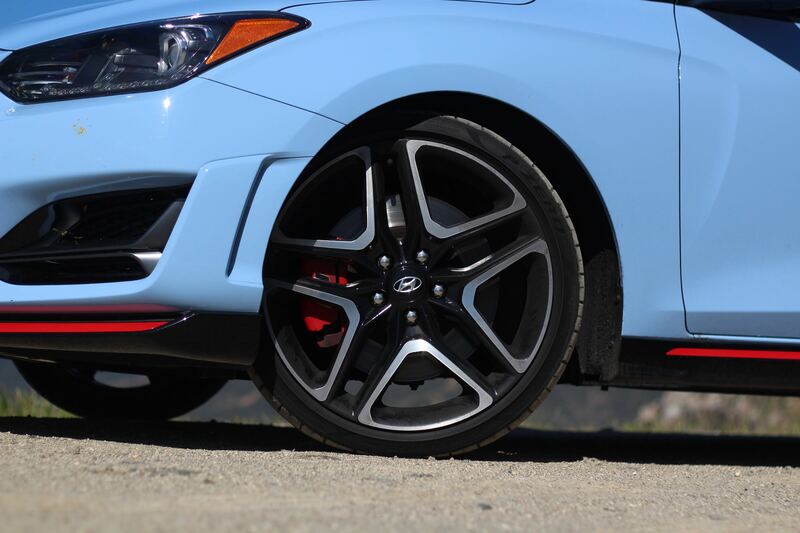 The Pirellis grip like plaid on a hipster and the N gives you tremendous confidence to hustle through corners. 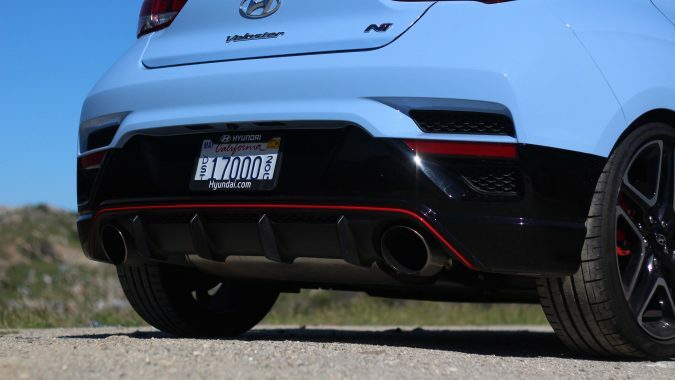 The thing about the Veloster N is that it’s thoroughly resolved. 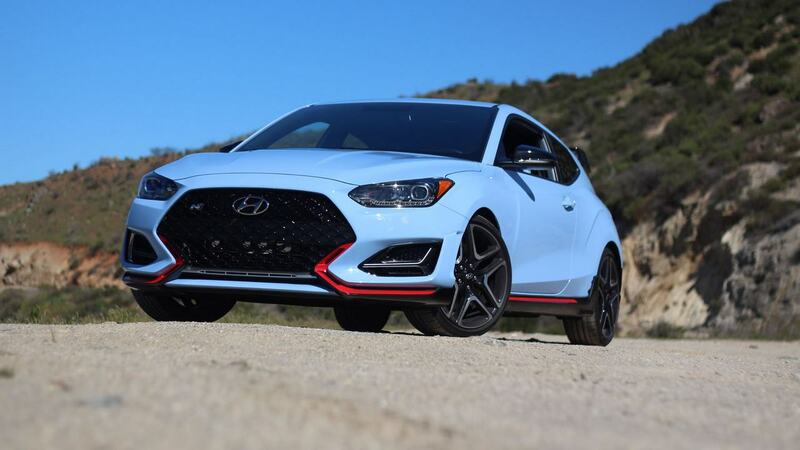 The stiffer chassis, tires, spring rates, adaptive dampers, and the E-diff combine to make this one of the most competent hot hatches you can buy today. 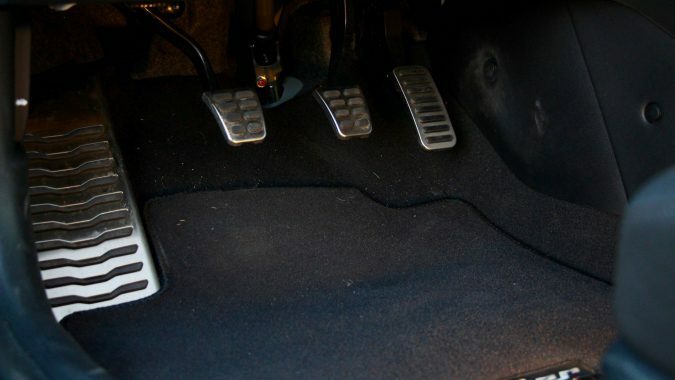 Putting the power down is child’s play and the N begs you to get on the accelerator earlier and earlier exiting a corner. 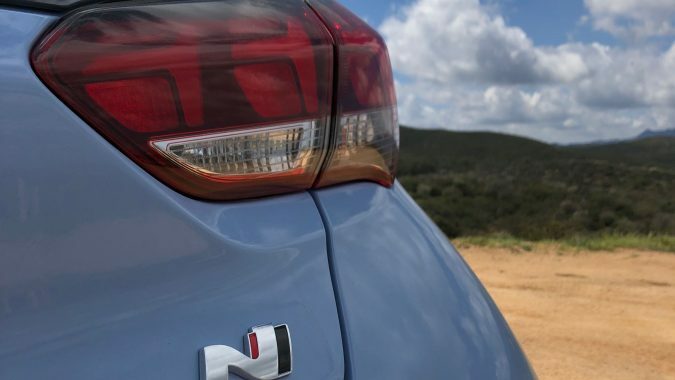 This is hot hatch handling 101 and other carmakers should take note. 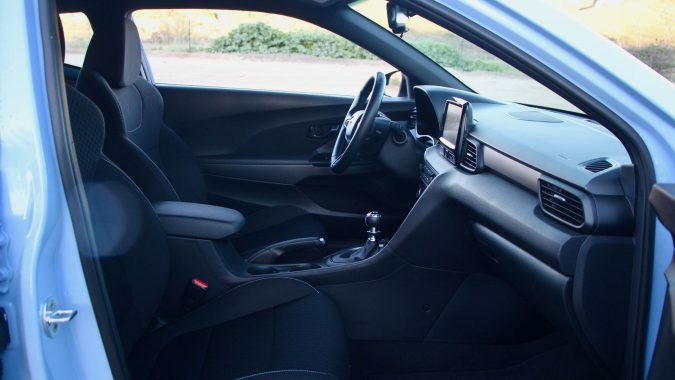 The seating position is near perfect, with great visibility, adjustability, and all primary controls in the right place. 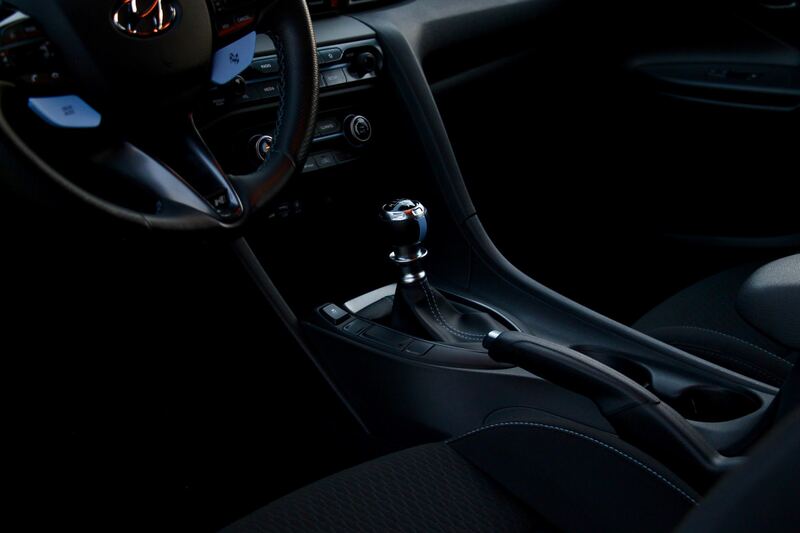 Pedals spaced well, shifter is great, steering is precise, and the brakes have excellent feel and modulation, all of which gives the driver lots of confidence to attack any and all corners. 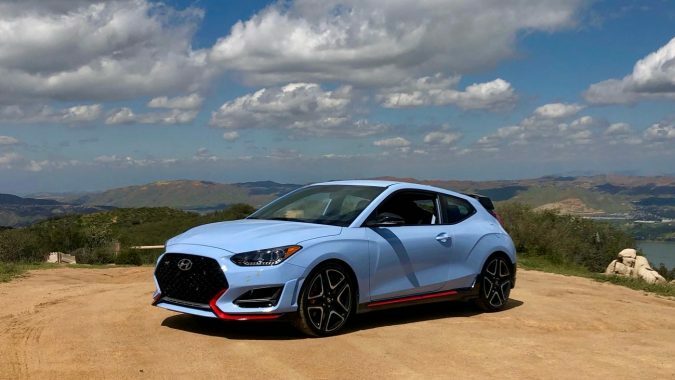 With this Veloster, there are a range of options, and with one click of the checkered flag button on the steering wheel, you’re in full attack, N mode, where everything is set to maximum. Throttle response, steering assist, exhaust, and so on, get very aggressive, but N mode is best saved for the track because it’s just slightly over the top for the road. 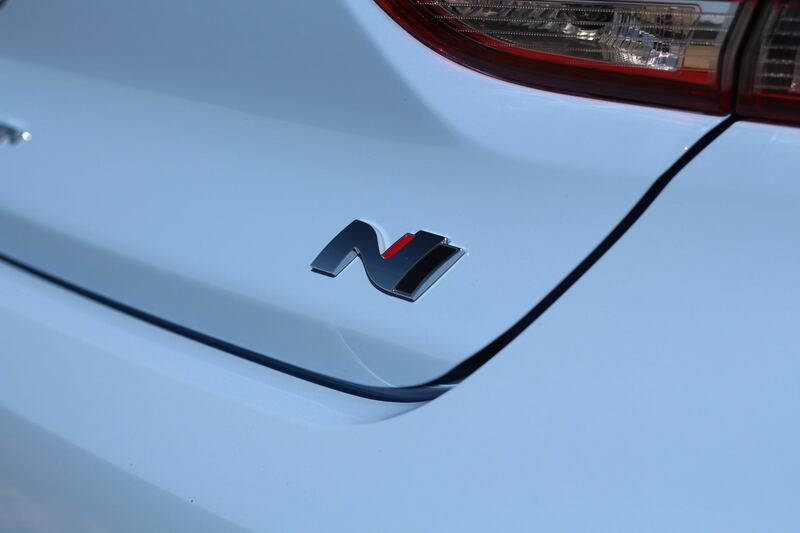 N mode defaults to the firmest damper setting, which doesn’t really work on the road because you need that suspension to work a little bit. 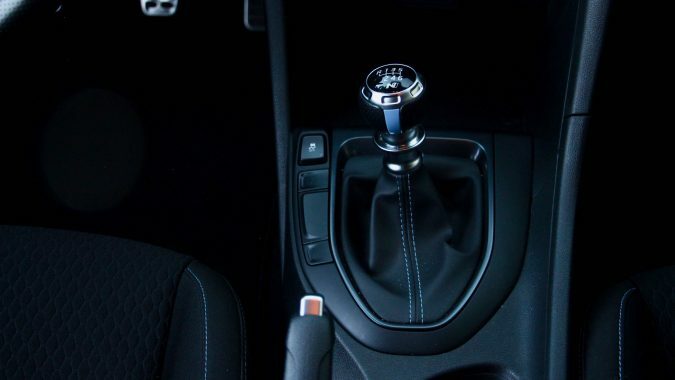 In daily driving, the best drive mode configuration is a custom setting with both the dampers and steering dialed back a bit. 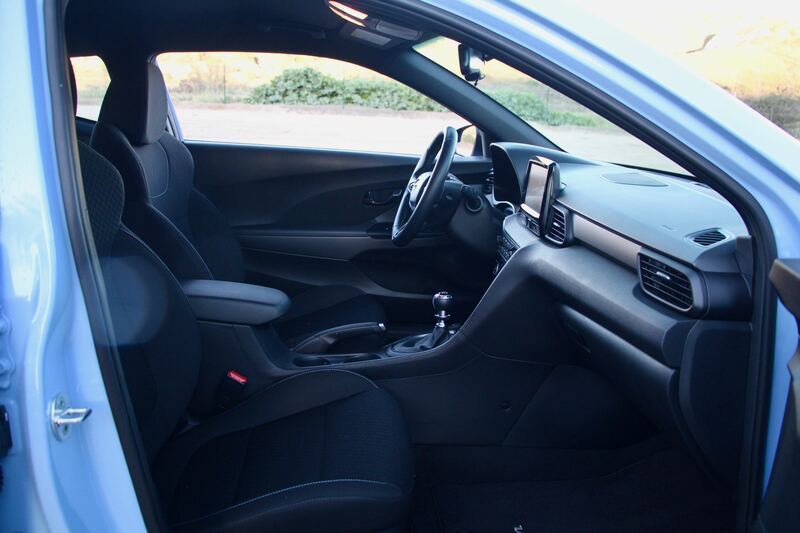 The ride remains comfortable and the steering is easy and light, but still precise. 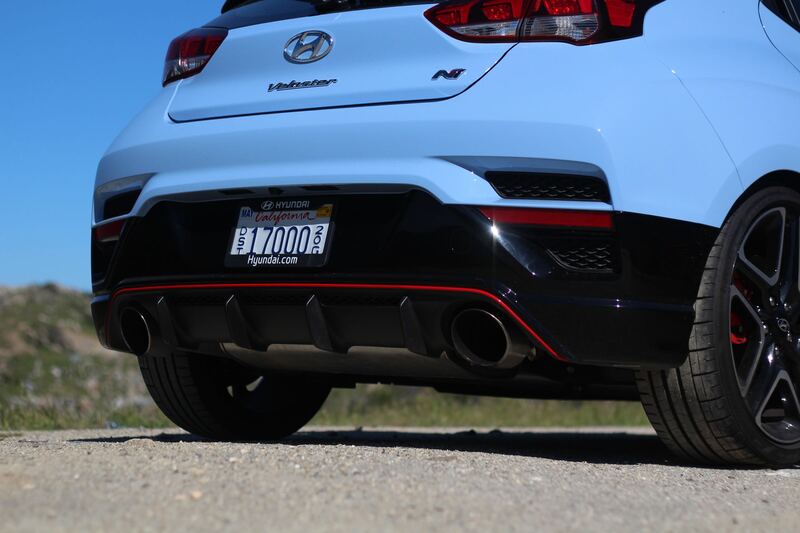 Naturally, you can still set the exhaust to loud mode in your custom setting for those fun, yet juvenile, loud cracks and pops. This Veloster itself is a bit of an oddity, perhaps a sort of automotive mullet. 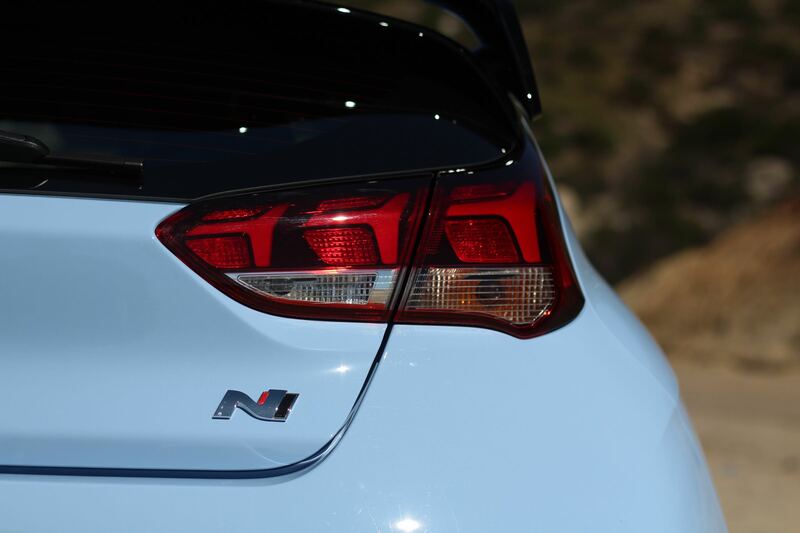 On the driver’s side, it’s a sporty coupe, and on the other side, it looks like a practical four door hatchback. 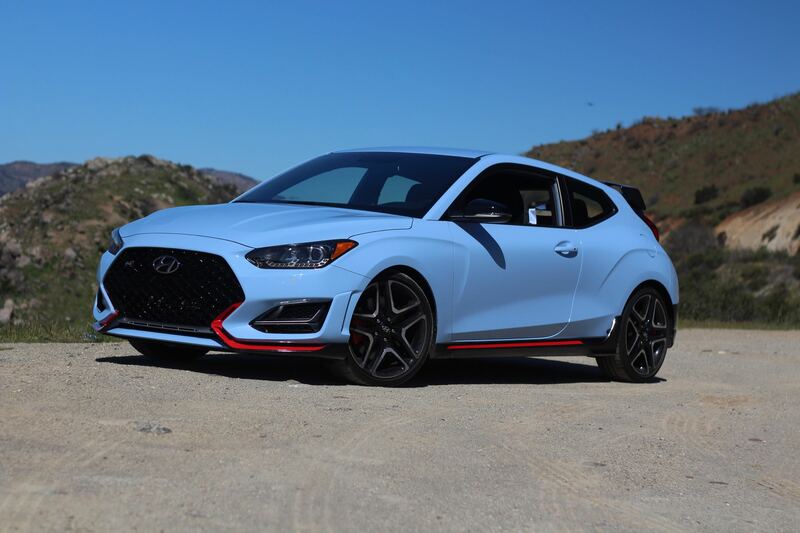 Whether this unusual configuration actually gives the Veloster any sales lift is anyone’s guess, but it sure does make it unique among hatchbacks. 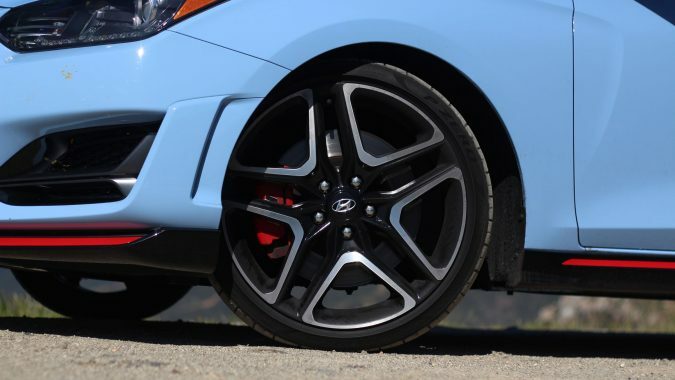 There’s no question that the Veloster N was built to a price point, there are a few compromises, but the N would benefit from a lightweight, forged wheel. 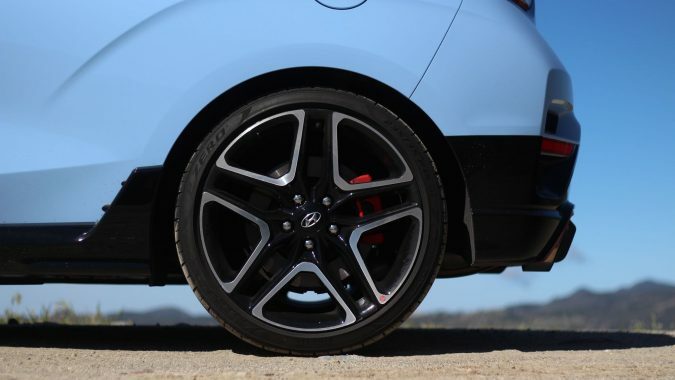 After some time with the N, the mass of that attractive black and silver wheel is obvious, and a lighter wheel would help the suspension work a little easier and lend a lithe feel to its dynamics. 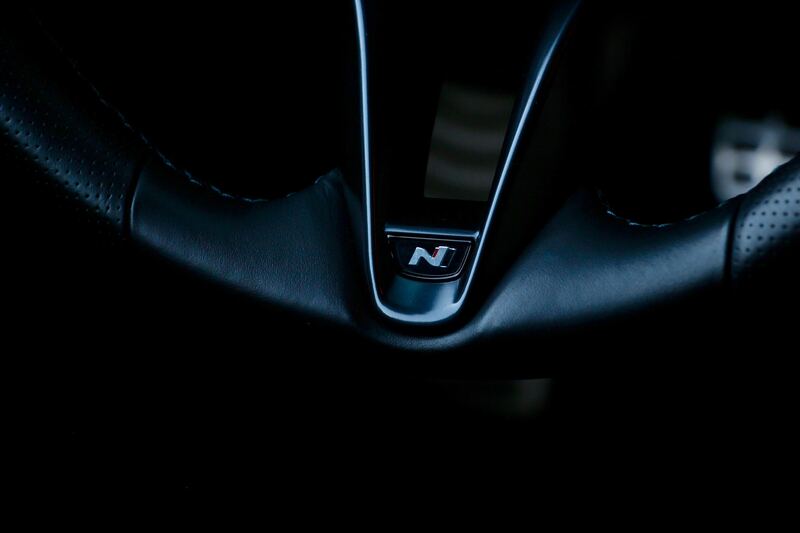 Because this N is so darn good, there really isn’t much to complain about. 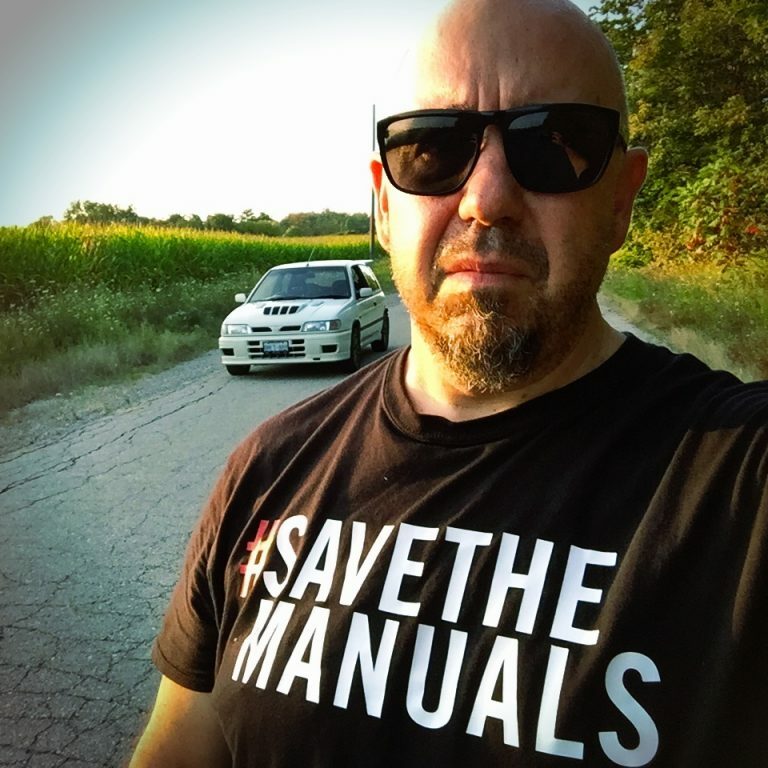 Digging deep to find criticism, one could say that stiffer engine mounts would feel better for corner carving and track days, but the compromise is increased noise, vibration, and harshness, which nobody likes in their daily driver. 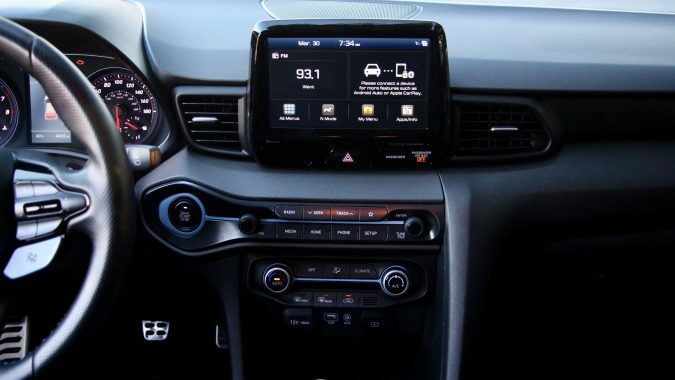 Of course, since it’s a Veloster, some of the interior materials on the dash and doors are noticeably hard plastics, but this should be expected in a sub-compact hatchback. 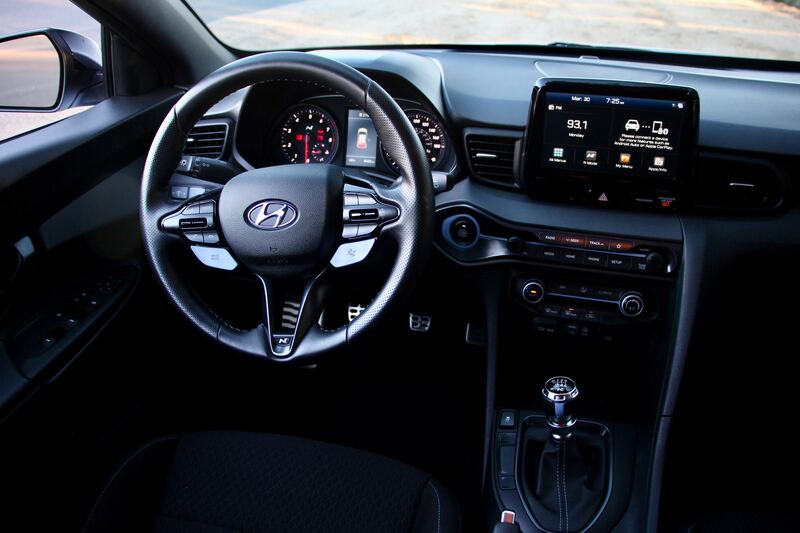 The interior is like all modern Hyundais with a refreshingly straightforward design. 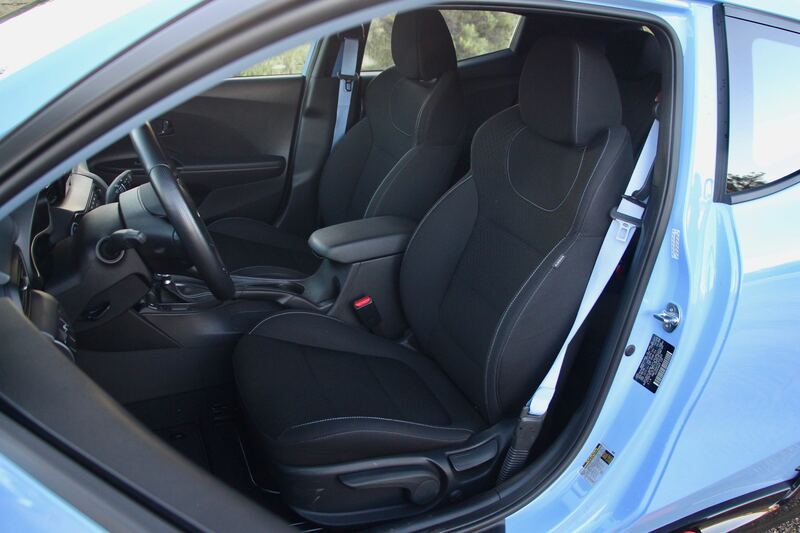 The interfaces are simple and easy to use and the best part is that the upholstery is cloth. 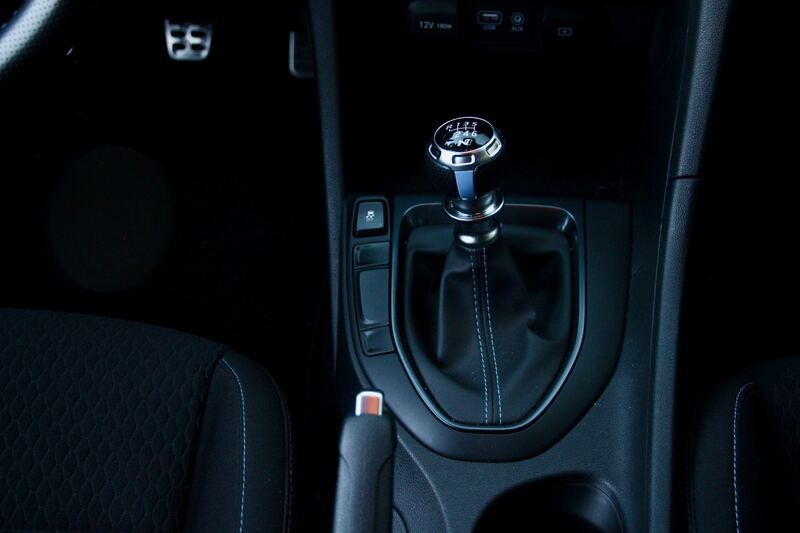 That’s always the right choice for any kind of performance car. 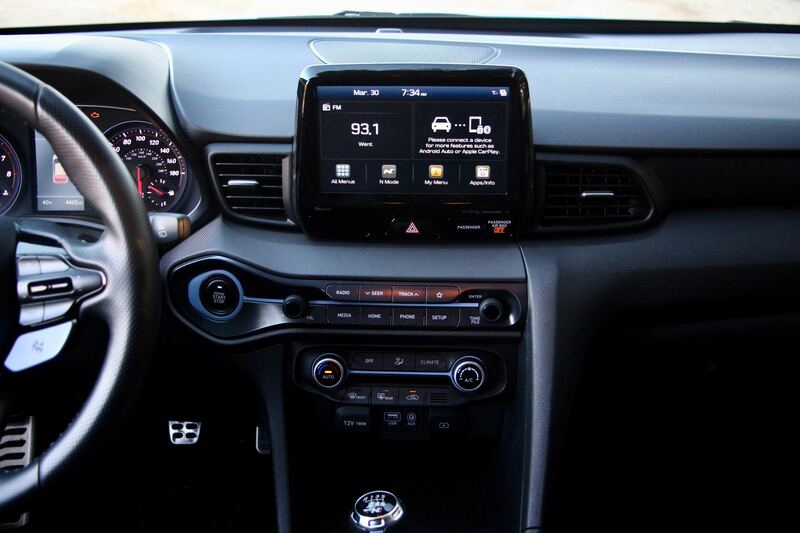 The standard sound system sounds great and the infotainment system has the expected mobile connectivity. 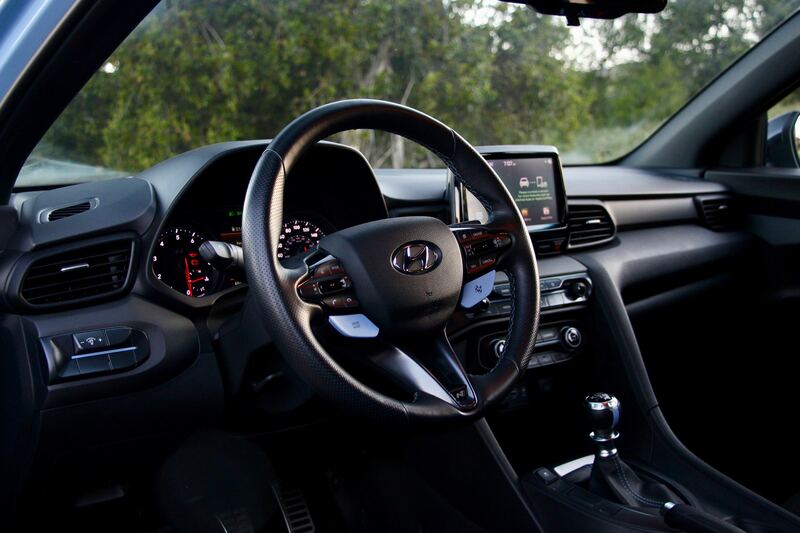 The rear seat is still sub-compact Veloster, which remains best suited to small children and shopping bags. 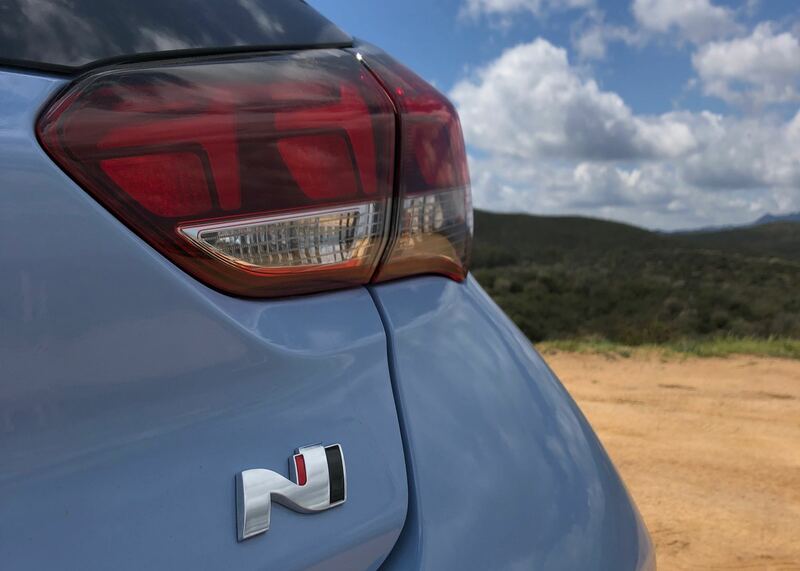 Cargo room under the hatch is generous, making the N a reasonably practical car. 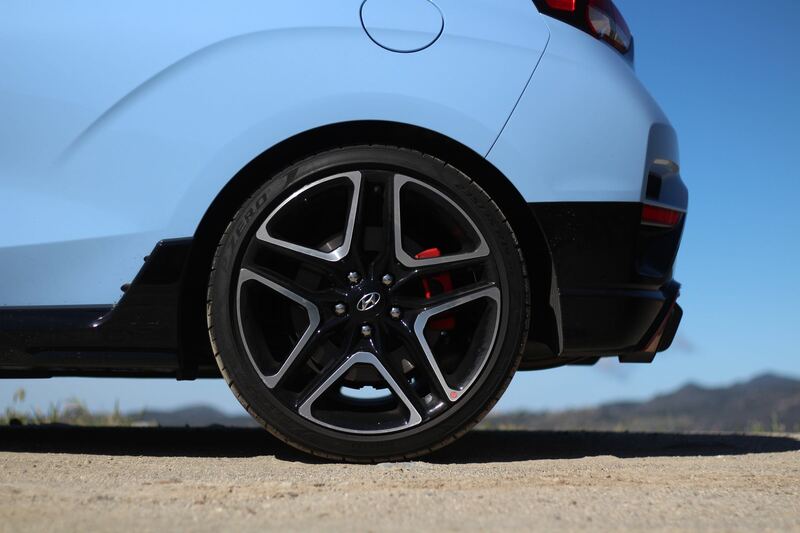 That’s what a hot hatch is all about, isn’t it? 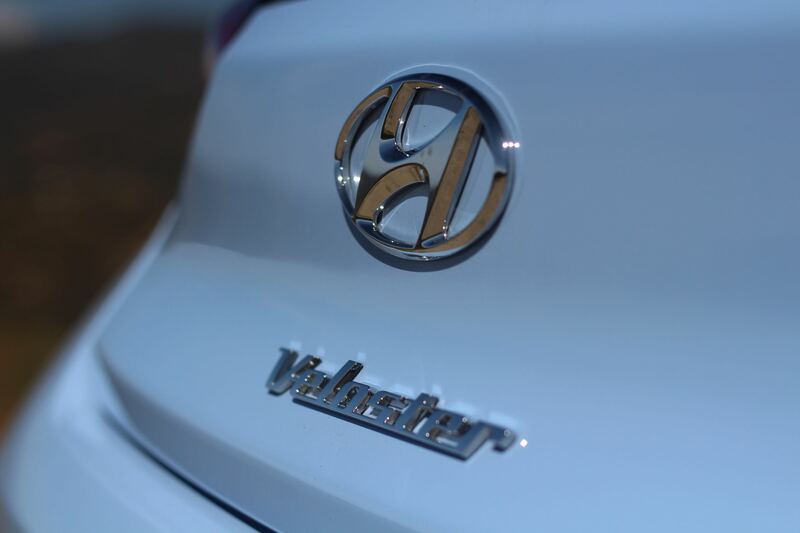 A little practicality and a whole lot of performance. 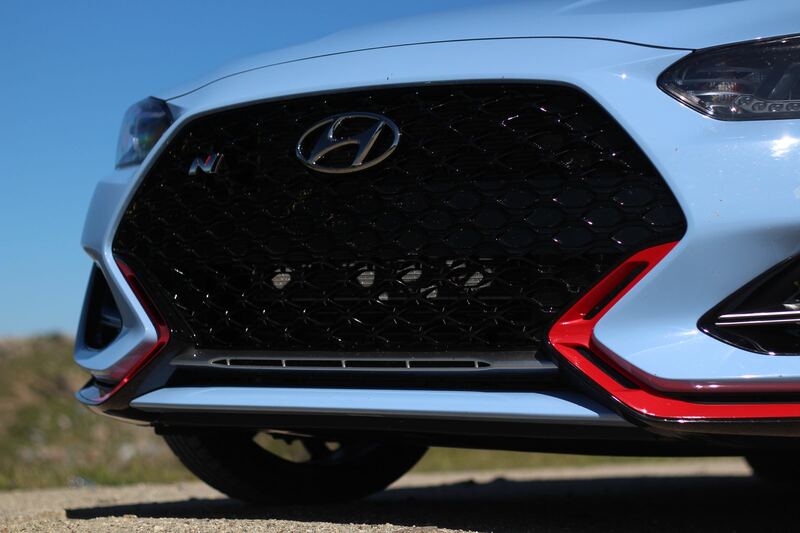 This Veloster N is a thoroughly competent hot hatch and it’s truly thrilling to drive. 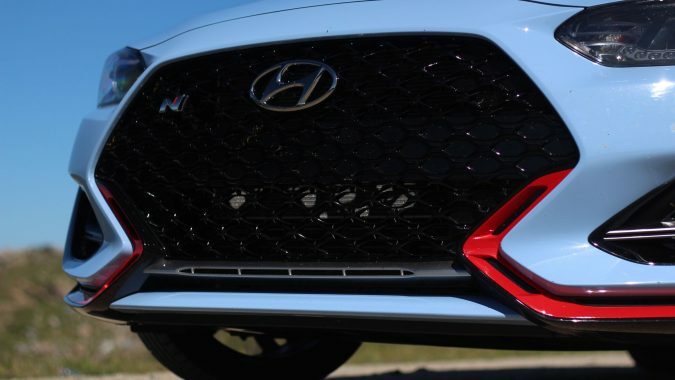 While it’s taken Hyundai a long time to take a swing at engineering something for the enthusiast, it’s exciting to see the company pull this off and it’s no easy task. 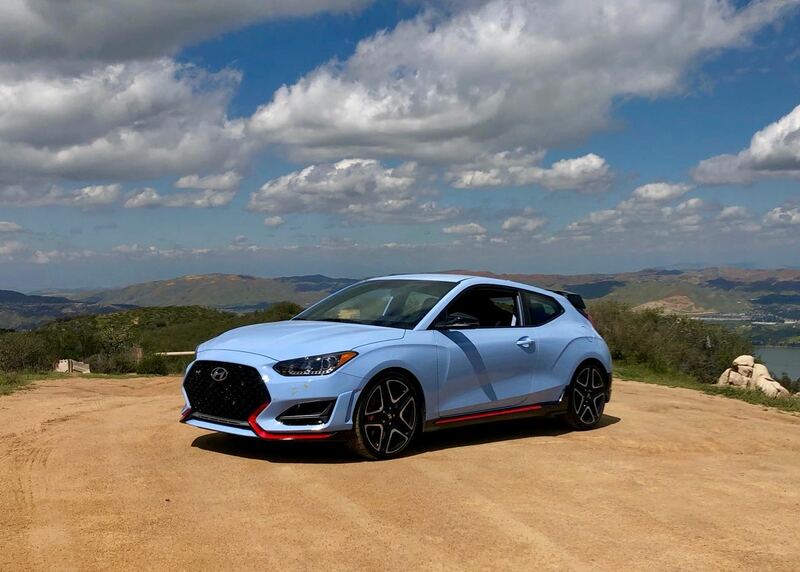 For their first real performance car, they’ve hit a grand slam home run with the Veloster N.
BODY STYLE: sub-compact, four-door hatchback. 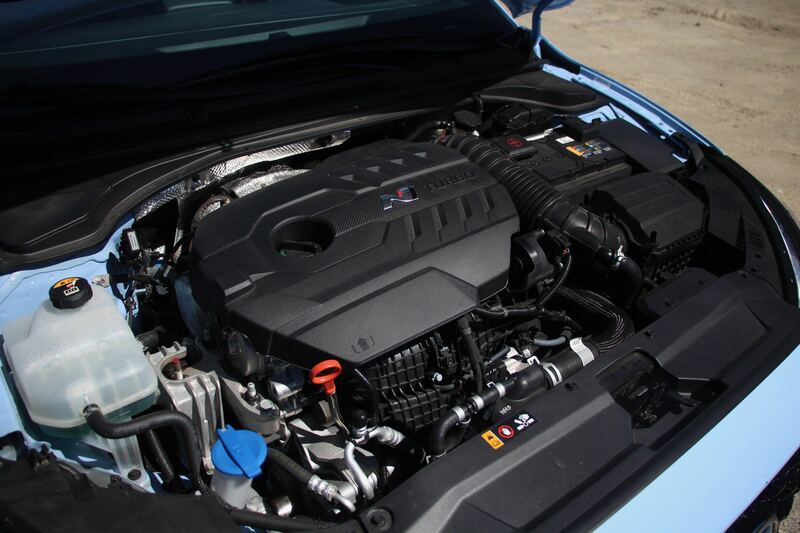 ENGINE: 2.0-litre turbocharged four-cylinder engine (275 hp, 260 lb/ft of torque) with a six-speed manual transmission. 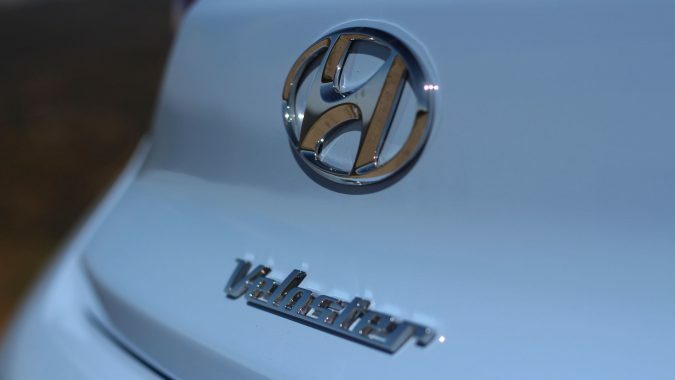 FUEL ECONOMY: 10.6/8.3/9.5 L/100 km city/hwy/combined.